The Upper Klamath is blessed with flows suitable for whitewater rafting from April through October. 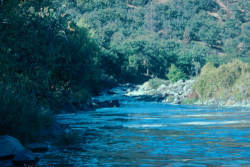 The water of the Upper Klamath is mostly controlled by John C. Boyle Powerhouse in Oregon. J.C. Boyle has two generators that can pump out 1250 cubic feet per second (or cfs) each, while free flowing streams feed about 400 cfs of water into the river. JC Boyle Powerhouse usually shuts down for a few weeks in June or July. You can obtain current river flow information by calling the Pacific Power and Light flow phone at 1-800-547-1501. In the peak of spring runoff and upstream reservoirs are full, JC Boyle generally runs both generators which equals approximately 3000 cfs. The rest of the season JC Boyle runs one generator which equals approximately 1700 cfs. The water usually rises around mid morning and flows through early afternoon, but other climatic factors can change this schedule so check the flow before you go to put-in.